This 3D printing stock has been on a roller-coaster ride in 2018. Here's what investors should know. Shares of 3D Systems (NYSE:DDD) plummeted 36.1% in October, according to data from S&P Global Market Intelligence. Despite the big drop, the 3D printing company's stock has still gained 49.7% in 2018, through Friday, Nov. 2. For context, shares of main rival Stratasys declined 17.5% in October and are up 20.8% so far in 2018. The S&P 500 fell 6.8% last month and has returned 3.5% so far this year. 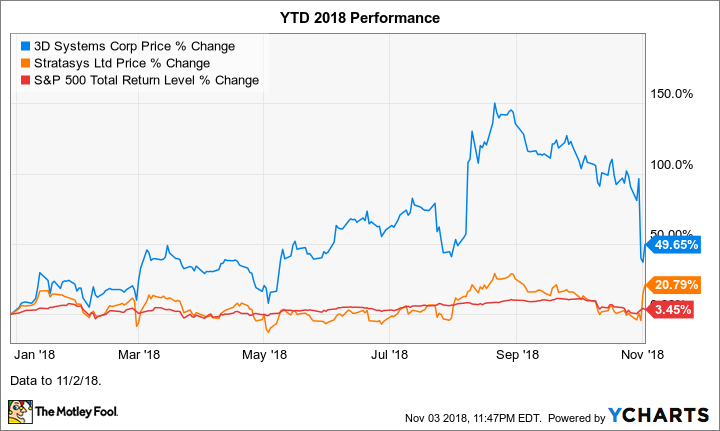 We can attribute 3D Systems stock's poor October performance to the company's release of third-quarter 2018 revenue and earnings results on Oct. 30 that were worse than Wall Street and many investors were expecting. Cash from operations coming in negative also probably weighed on the stock. For the quarter, 3D Systems' revenue increased 7.6% year over year to $164.5 million, representing a deceleration of growth from the second quarter, when revenue grew 10.7% year over year. On a GAAP basis, the company's loss per share narrowed to $0.10, from $0.34, and, on an adjusted basis, it posted earnings per share (EPS) of $0.02, versus a loss per share of $0.20 in the third quarter of 2017. Wall Street analysts had been looking for adjusted EPS of $0.03 on revenue of $171.9 million. It's not surprising that 3D Systems stock took a big hit last month. It ran up too far, too fast in 2018, particularly after second-quarter results were released. Granted, there have been some encouraging signs, but it was much too early for the unrestrained giddiness with which the market reacted after Q2 results were released. (Though some of the stock's big rise at that time was surely due to covering by short sellers, as there is a high short interest on this stock. About 22% of outstanding shares were sold short, as of Oct. 15.) The company's successful turnaround will depend on it being able to profitably grow revenue and generate cash from operations.